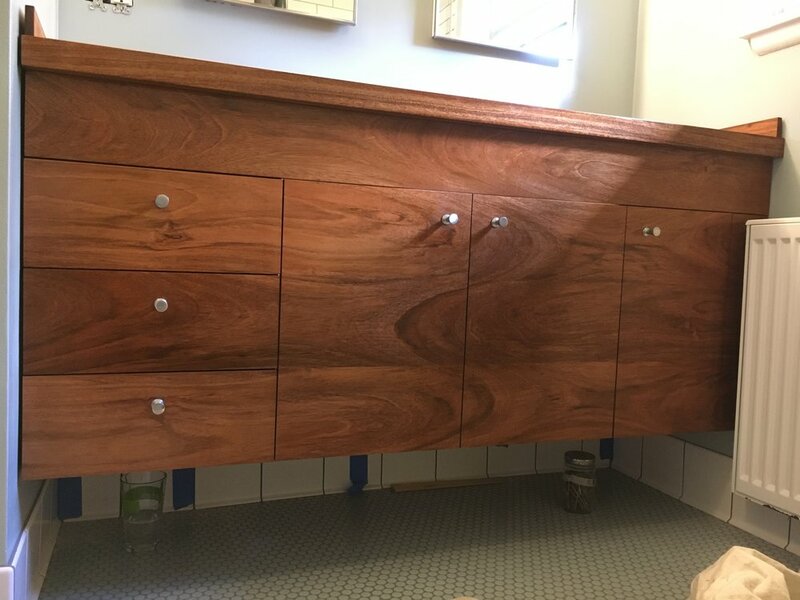 This client came to me from a previous client with a similar problem: how do you get a full-sized cabinet into a tight space? In this case, they wanted to fill a bathroom alcove with a vanity, but the entry hall was narrow and a heater blocked straight-in access. I designed a modular system of two base cabinets that could be installed separately. A central space between them contained removable shelves (for access to the plumbing) and was covered by doors. A great, functional solution! The best part of this project, though, is the wood. When I met the clients at the lumberyard they’d already picked out a perfect 2″ slab of jatoba (brazilian cherry) for the top; I picked out the rest of the boards to match. The thick wood top is absolutely gorgeous on its own. But then there are the doors…. 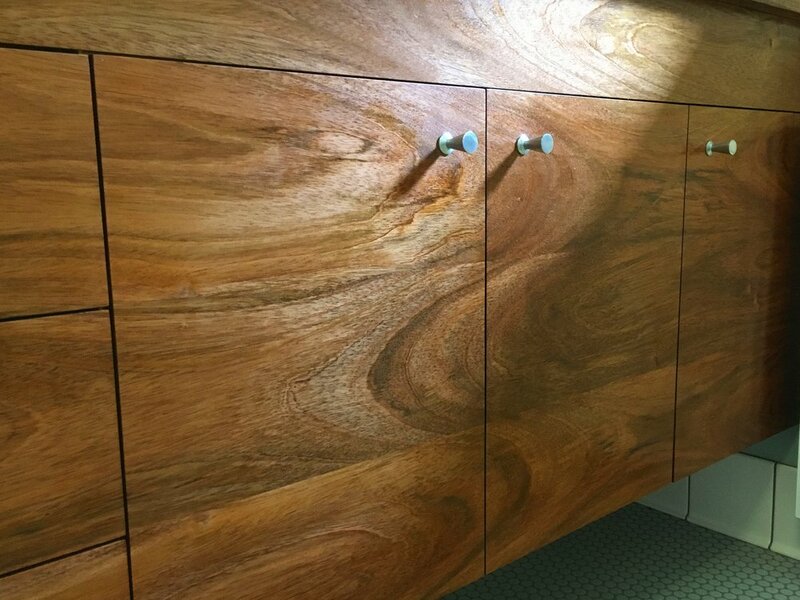 I used four strips of shop-sawn bookmatched veneer to create the front of the cabinet. 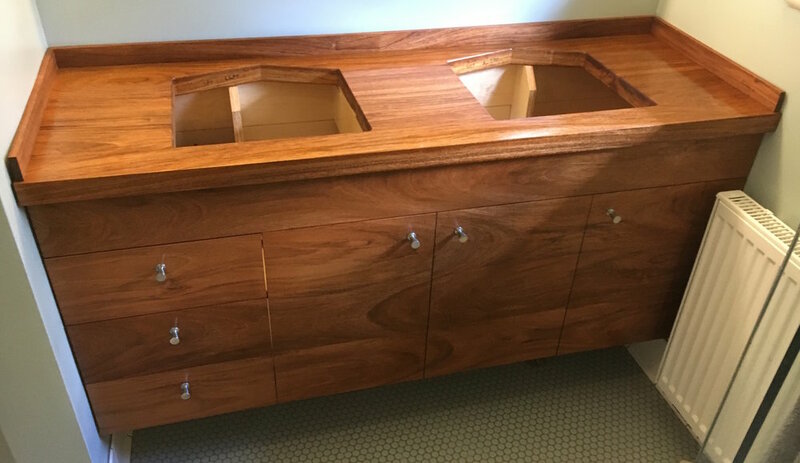 One strip mounts under the top and covers the sinks; the other three were combined to create the drawer and door fronts. I’m particularly proud of the central swooshing figure that is split by the two central doors. When you buy custom fine furniture, you’re paying someone to pay attention to the grain details, and it’s my favorite part of the job!